Combo comes with 55 Lbs. wing, SS backplate with harness and FREE harness knife. Technical wing for twin tanks (doubles). Rock solid construction. Streamlined for effortless swimming, low drag for scootering. These wings are designed specifically for use with double cylinders. They provide 55 pounds/25l of lift. 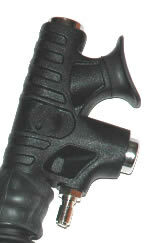 They are designed for use with medium- to heavyweight doubles and stage bottles. 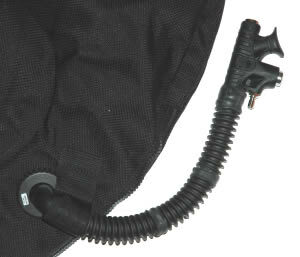 A 24-inch/60cm low-pressure inflator hose is included. Available in Black. This wing is popular among many European cave divers, who appreciate its simple, streamlined design. Wing bladder: inner bladder made from RF welded CORDURA 560 with PU coating. It resists hydrolysis, low temperatures, and hydrocarbons. Virtually indestructible. High quality Swiss RiRi zipper. 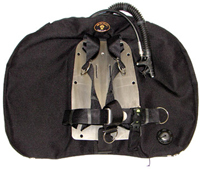 This backplate/wing/harness system comes complete with streamlined waist mounted knife (Hogarthian style)!